Northern Cyprus is probably the last place on earth untouched by the fast food giants like Macdonald’s, Burger King, KFC and Pizza Hut – which means that others have been free to develop their own fast food outlets offering a far wider, less restricted choice. 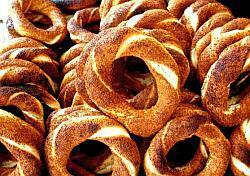 The popular Simit Dünyası chain, found in most towns, offers a good choice of pides (traditional bread type pizzas), simits (baked dough rings covered in sesame seeds), pizzas and other various other offerings, all are fairly cheap and ready to take away or eat in. Another successful chain on the island offering the same kind of thing is Dano Patisserie where you can also try some of their yummy sweet cakes or freshly baked breads. If you class pizza as fast food, then again there seem to be a vast amount of places to choose from these days, including the brilliant Mani Peni on the New Harbour roundabout in Kyrenia. Fast food it may be, but the restaurant uses fresh ingredients like mozzarella and rocket on their pizza menu making it a tad more fancy! The pizzas here are baked traditionally and you can watch them being made, or you can choose from winter warmers such as good old ‘spag bol’ or a steak cooked to your liking, all available as take away options. 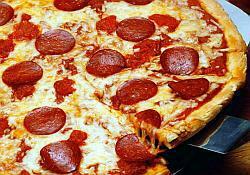 Another good choice for fast food is Pasta Mania on the road to Edremit, west of Kyrenia, which is a popular place for those seeking a more pizza and pasta orientated meal with take away options available. There are also a range of burger bars such as Burger City, these restaurants are attached to the Lemar supermarket chain so you can always find them when you visit the supermarket! 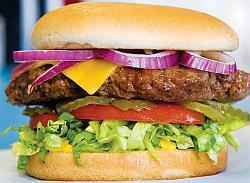 There are other alternatives on the burger front, usually from smaller outlets such as Kermia Fried Chicken (yes KFC!) in Lefkoşa, or some of the cafes do their own versions too. 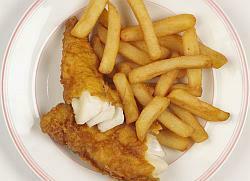 Fish and chips are also available from a growing number of places, with Cod Baba in Karaoğlanoğlu being one of the more popular fish and chip venues where you can order to take out or eat in. Another fantastic service, if you don’t want to walk any further than your front door, is the take-away delivery service offered by a lot of restaurants like Ezic, Passport and Beytis which all have a moped delivery service. You can find contact details of these restaurants via the web or through the local Buzz Book directory or in the local Cyprus Today newspaper, however be warned that they only deliver within a certain radius so you could be out of luck if you are up in the mountains! One more definitely worth mentioning is the relatively new, but seemingly very successful www.yemeksepeti.com – you can order your fast food meal by logging on via the internet, placing an order online, and hey presto it’s delivered within 20-30 minutes (hopefully!). You don’t even have to talk to anyone but the delivery guy! 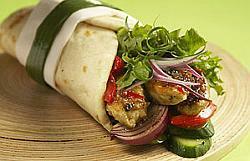 Your order will be delivered from the specific restaurant you choose, and you pay on delivery. We’ve tried it with great results! 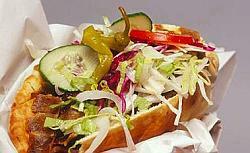 Oh, and we must not forget the good old döner kebab! If you fancy a quick bite to eat on the move then there are plenty of places where you can order a take out döner – this is either chicken or meat cooked on a revolving spit, sliced into thin strips and wrapped in a flat bread and served with salad – yum! So there you have it, a rather brief look at the take-away and fast food options available to you in North Cyprus. If you would like to find out more about other options including family restaurants, European and international , a la carte or hotel dining or traditional Turkish Cypriot cuisine, please click on any of the links.